Technology makes it so much easier to complain about technology, now doesn’t it? Let’s do that for a minute and then get to the part where I refer you to read an ironic post that I wrote. Facebook is rivaling the Grinch in terms of seasonal spirit by starting to force blog fan pages to pay in order for their followers to actually see what they post. Now I know it’s annoying that I’m complaining about this again, but seriously? It’s ridiculous, and I’m not going to pay Facebook to share my nonsense with the masses when that money could be spent buying pesto. No, instead I’m going to be POSITIVE and invite you to subscribe to my blog via email (see that nice little option on the left side of my blog? ), follow me on Twitter (one-liners I should probably keep to myself) and remind you to make sure you’re selecting the “Show in Newsfeed” and “All Updates” on Facebook. Unless you’re actively trying to avoid me, in which case — carry on as you were. Let’s move on. I’ll have a new post for you here this later week that doesn’t involve self-promotion that makes me feel uncomfortable and twitchy like this does, but today I’m back over In The Powder Room talking more about technology and cults. What do those two things have in common? I suppose you have to click…HERE to find out. I prefer pesto to popularity. You have various options to either interact with or ignore me. The serving size suggestion on hummus is about as useful as a Kindle is to a Kardashian. Clicking this link will trick In The Powder Room into thinking that I have friends. One of those things doesn’t belong, but I felt it was valid. Anyway, go forth and read about cults, soak in the irony of that statement and I’ll see you here for my next post. Unless you’re actively trying to avoid me, in which case — carry on as you were. I actually have a new post to publish, but I like to read my posts out loud to the cat before I publish them so that I can prepare myself for no emotional reaction whatsoever, and she’s been on a catnip bender this week. Twice I came home to find her burning incense and eating Cheetos while hanging upside down off the couch. She knows she’s not allowed on the couch. 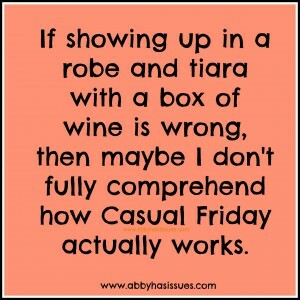 Anyway, she’s penciling me in this weekend so Monday I’ll probably share whatever it is I wrote that I already forgot about because it’s been a long week. In other words, this is a post that isn’t really a post but just wrapping up a few odds and ends. First of all, I’m over In the Powder Room talking about shopping for pants and you should go read it. I know, I know. Who am I? First I talk about ta-tas and then retail. But seeing as I’m equally ignorant and ambivalent about both topics, I felt I was qualified to write about them on the Internet. Speaking of the Internet, anyone who has a Facebook fan page knows what a pain in the dupa it is to actually get people to see your posts. Most of the time the stats show only about 25 percent of my “fans” see anything that I share. If you’re not doing that on purpose, check out the handy tip sheet Kim from Let Me Start By Sharing made to simplify the process. 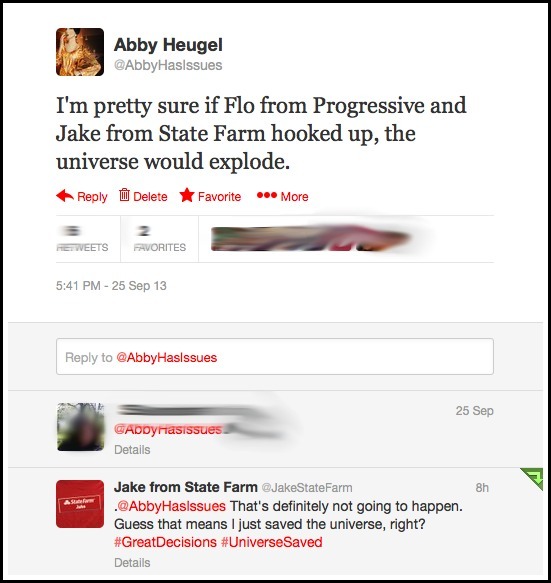 And finally, I hate to brag, but Jake from State Farm replied to one of my tweets. Sorry I’m not good at screenshots. He had to had to stalk his name to find it (weeks later) and doesn’t have that many followers, so maybe he is as hideous as the commercial suggests? All I know for certain is that he’s wearing khakis and emotionally available at 3 a.m.
That’s more than I can say. Anyway, that’s the end of this post that isn’t really a post. Now entertain me. If you could sum up your week with one movie or song title, what would it be?